This charming hotel is situated in Gianyar. Gatra Ubud Inn guarantees a quiet stay as it counts with just 10 rooms. 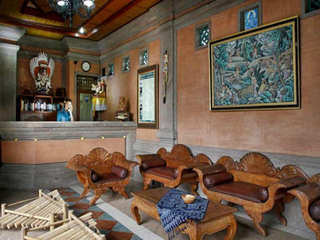 This hotel is located in the artistic and cultural hub of Ubud, lying con Monkey Forest Road. 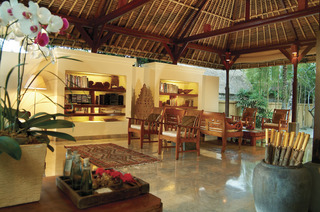 The hotel is located just a 5 minutes' driving distance from Ubud Shopping Centre. Guests will find themselves within easy access of a host of attractions in the area, including the monkey Forest, Batur Lake, Sanur Beach and the city of Gianyar. This charming hotel is situated just 50 km from Ngurah Rai International Airport. 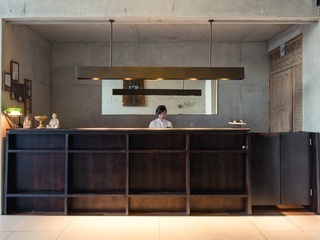 The hotel has been designed as a contemporary interpretation of traditional Balinese architecture. The guest rooms are eloquently appointed, exuding charm and poise. The rooms are well equipped with modern amenities, for added comfort and convenience. Guests can enjoy a host of exciting tours and trips organised by the hotel, including trekking trips and tours to the botanical gardens. Guests will appreciate the host of facilities and services that the hotel has to offer. There are a total of 37 rooms on the premises. This attractive hotel provides the ideal base for both sightseeing and business. The Hotel provides 24-hour reception. Guests can enjoy access to the internet to stay connected to work or home. The establishment is wheelchair-accessible. Guests may take advantage of the on-site car park. Check-out is at . Pets are allowed on the premises. Large pets are allowed on the premises. This resort is located on Bisma Road, overlooking the Campuhan River. The resort is surrounded by paddy fields, and is immersed in the rich culture and tradition of the area. Guests will find themselves just a 10 minutes' walking distance from the cultural and artistic centre of Ubud. This wonderful resort is located within easy access of a host of attractions in the area, including the Monkey Forest, which is just a 5 minutes' walking distance away. Bali Denpasar International Airport is located just 35 km from this resort. This charming resort comprises 15 rooms, and is build amidst a lush, tropical rainforest. The guest rooms are beautifully furnished, featuring a Balinese style. This wonderful resort provides a range of excellent facilities and services, catering for the needs of every type of traveller. Surrounded by jungle, this upscale boutique hotel is 1 km from the Puri Lukisan Museum, 6 km from Ubud Monkey Forest and 11 km from the Tegenungan Waterfall.Featuring ornate woodwork, the polished suites offer free Wi-Fi, flat-screen TVs and minifridges, as well as wooden soaking tubs and separate living rooms. Some offer private gardens, courtyard access and/or balconies. Room service is offered.Freebies include breakfast and parking, plus yoga, dance and cooking classes. There's also a high-end restaurant, a terrace and 2 bars, 1 on the rooftop and 1 next to the outdoor infinity pool. Other amenities include a gym and an on-site shrine. Aria Villas Ubud is a modern private boutique villa development designed by Singapore - based architect, Chioh-Hui Goh, principal architect at studiogoto. The villas seamlessly blend design, luxury and an immaculately clean style with a firm environmental vision.Nestled within a green valley offering spectacular sunsets, renowned Salad Dressing principal, Huai Yan has ensured that the landscaping at Aria Villas harmoniously integrates with the existing flora.Aria Villas represents a fresh interpretation of Balinese design and architecture. All of the design specialists who worked on Aria Villas were chosen for their talent and ability to inject a young and spirited enthusiasm whilst being aware of and sympathetic to the local environment and culture.Each of our 8 private pool villas have unobstructed views overlooking a lush green valley. Pool Villas are available with 1 or 3 bedrooms or a combination of 2 adjoining villas to create a 4 bedroom unit with 2 pools. A 24 hour front desk is available.Aria Villas is located a mere 500 metres away from main street Ubud, making it one of the best located pool villa developments within walking distance of the multitude of cultural attractions, restaurants, bars and shopping hotspots that Ubud has to offer.